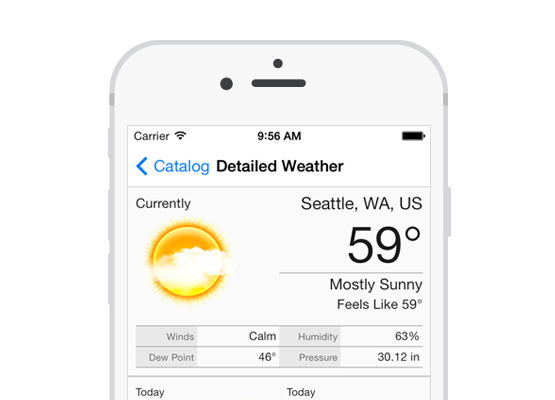 Quickly integrate weather data and imagery into your iOS applications with very little effort. The AerisWeather SDK for iOS and tvOS allows a developer to quickly and easily add weather content and functionality to their iOS and tvOS applications quickly and easily without having to code anything themselves. It utilizes the Aeris API backend for data loading and is built on top of an object mapping system that efficiently loads requested weather content into third-party iOS and tvOS applications, greatly reducing the amount of code and development needed on the developer end. Looking for the version 2.0 docs? You can still access the documentation for version 2.0 of our iOS SDK here. You can learn more about the various ways to load AerisWeather API data into your application by reviewing our Getting Started guide. Also, make sure to check out how you can add a fully-functional weather map powered by our Aeris Maps Platform (AMP) or graph various weather data from our API. Be sure to review our complete demo application for extensive SDK usage examples and code and our selection of quick code examples.